So these are the typical pressures you would see when key is on, engine is off, these are the static system pressures. With a quality A/C Manifold Gauge Set you should see the same pressures readings, less 1 bar(14.7psi) and the reason that there is less 1 bar of pressure is that the chart reflects the G65 readings in the MVBs and the G65 will read 1 bar (14.7psi) when NOT under pressure, at sea level. So always take away '1 bar' from the MVB reading to get a 'gauge' reading equivalent. - Typical 'dynamic' pressures differ because there are a lot of different factors that can influence the gauge readings. There are some excellent books written on the subject. You should NOT "top off" any AC system with first knowing how much refrigerant is the system, doing so can easily over charge the A/C system and cause compressor damage! You can not compress liquid refrigerant with an automotive compressor and an overcharged A/C system may send liquid refrigerant back to the compressor causing stress, cracking of the internal components which maybe difficult to see or detect. - You can start with an empty system, it is recommended to pull a vacuum on the system to remove(boil) moisture and assist in charging. - Using a scale record the gross weight of the container of refrigerant. - Then slowly charge the system while periodically checking the weight of the container until the desired weight has been transferred. Terminals can rot inside the terminal housing. Using a hook tool, gently tug on each of the wires to verify they have not come apart. I recoded the HVAC head for the N280 regulator valve instead of the clutch setup of the 2.7T compressor. Swapped over the evaporator outlet sensor. 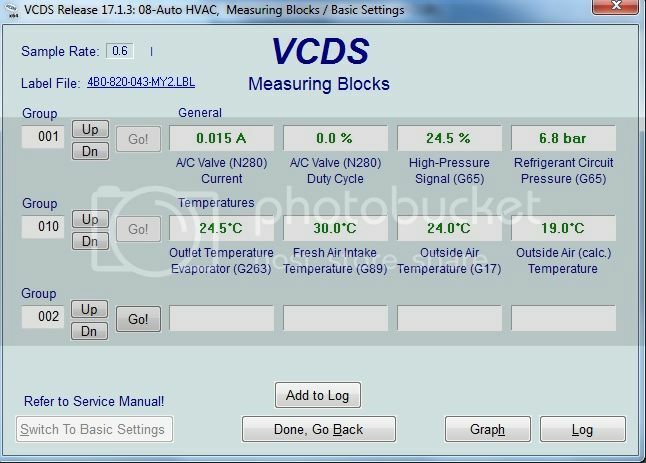 As you can see from the screen shots below, I'm getting an ambient air temp reading, a high pressure sensor reading, a evap outlet temp reading and a intake air temp reading. I have no fault codes stored in the HVAC head. I have rang out the N280 regulator valve on the compressor and it was 10 ohms. I have grounded Connector D PIN 8 at the HVAC head and I can hear N280 regulator valve clicking on and off. 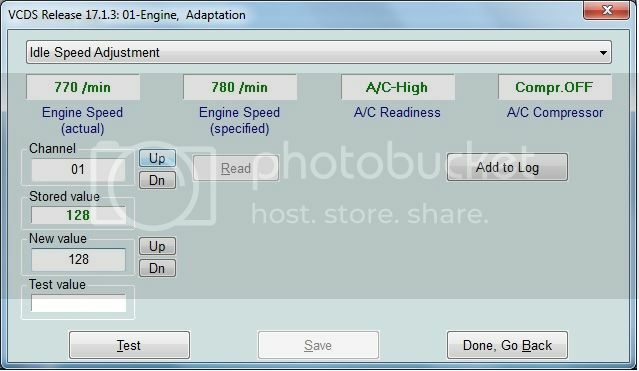 I have 14.35VDC at the compressor electrical connector when the vehicle is running. If I jump N280 to power when the vehicle is running I can get cold air to start coming out the vents. For some reason the HVAC head is just not requesting the compressor to turn on. I have two different HVAC heads, same issue with both. 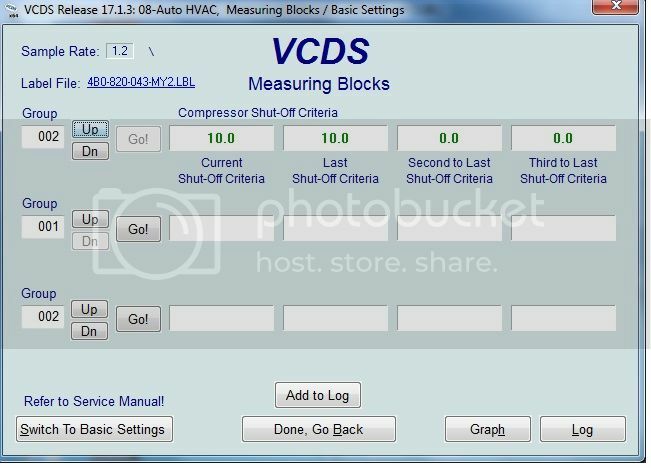 I did find one thing, there is a compressor shutdown code of "10" (low voltage) but as I mentioned above, I've checked voltage at the compressor, so I'm not sure what else this error could mean. I don't know if there's some adaption I have to go through or some procedure for clearing out the shutdown codes. Any help would be appreciated!! There'll be a MVB that gives what the 08-HVAC head thinks the vehicle voltage is. Would you check that and report back please? I'll put my AC manifold gauges back on it tonight, but I believe the low side was reading around 60-70PSI and the high side was about 100PSI. If I externally powered the compressor regulator valve the high side pressure would start to climb and the low side would start to fall. As soon as I removed power though it would go right back to the original readings. Your refrigerant gas pressures look fine; so I'd leave them alone for now. The Compressor Shut-Off criteria is exactly why the N280 is not engaging. If it was due to gas pressure; you'd get a Shut-Off code of 3. The control head definitely thinks it's voltage is too low. Have you potentially disturbed a wire in changing the head? All plug-couplers pushed fully home? All supply fuses to the HVAC intact? Terminal 75 is not a pin or chamber number, it's the DIN vehicle terminal number, like 30 is battery positive, 15 ignition live, 31 ground etc. T75 actually refers to the radio. 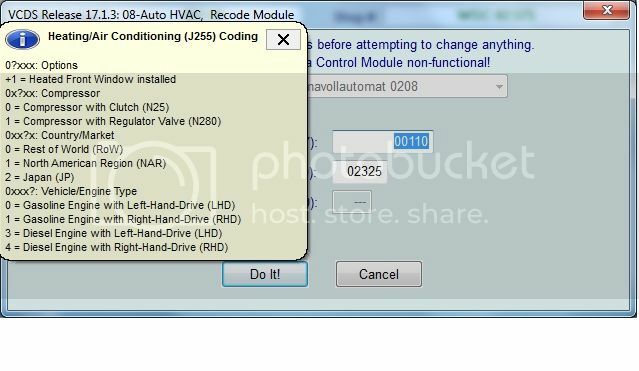 Verify that even though your control head accepted the coding, that the hardware version is compatible with an N280 compressor. If so, get the Wiring Diagram for your model and start tracing wires. Thanks for this information. I will look into everything you've noted and if I can't get anywhere I will post as a new question in one of the forums you suggested. With respect to what you said, I can say that it's probably not a hardware version compatibility issue; reason being is one of my HVAC heads is the one which was used when the car was a 2.7T (worked fine for 6 years and the one I attempted to recode) and the second HVAC head I have is the one that actually came out of the donor car which had the 4.2L & compressor w/regulator. So that should have been a perfect hardware/software match for the 4.2L engine/compressor. There's a very good chance I am missing a wire or I need to move wires(s) around going to my HVAC head. Because I swapped from the 2.7T to the 4.2L, I basically am running a 4.2L engine off the chassis harness of a 2.7T car. I did have to add in wires for the evaporator outlet sensor and many for the cooling fan circuits. I think I'm really close but I may be missing something. I can look at three of the four HVAC connectors in my part out car and do a comparison of what pins are populated and which ones aren't. But one connector is gone. I may also have to try and find a complete wiring diagram/pinout for the HVAC head. The AC does work momentarily when I recode the HVAC head as a compressor clutch but ultimately I get a code thrown in the HVAC head for a short on the clutch. I'm guessing this is because with the clutch, the HVAC head is just driving a relay (30mA?) and when it attempts to drive the regulator valve the current is probably spiking. (14V/10ohm=1.4A) I think my work around could be to code the HVAC head as a clutch compressor and let the original compressor clutch relay operate the N280 regulator valve. It'd be great if that worked but probably wouldn't.